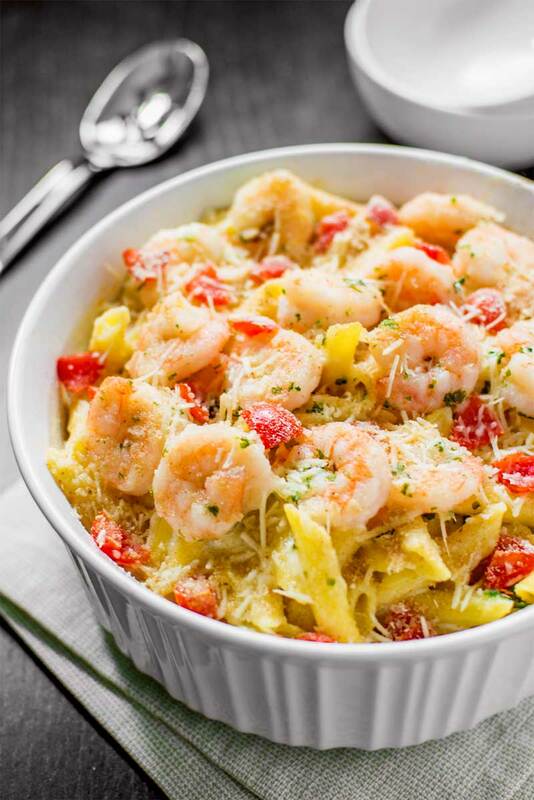 Bring the iconic taste of Olive Garden's baked parmesan shrimp to the comfort of your own home with this spot-on copycat recipe. So, it’s been a pretty meaty week over here at our house. And now I’m moving on to my beloved shrimp. You’d think I was going for a theme here but really I just wanted to spice things up a bit from my usual onslaught of dessert posts. I’m also really trying to improve my photograph of meats and pasta – which, ironically, is more challenging than it probably sounds. But it’s not like I’m complaining about being surrounded by tasty, delicious food fit for a carnivore. My quest to conquer all things cheesy and shiny just means that we’ve spent the past few days eating like kings. The Husband has been in an especially good mood lately, so at least it’s not just me enjoying it. This recipe is inspired by the Olive Garden dish of the same name, and it’s one of my favorite dishes to order there (you know, when I actually want something other than just bread sticks and alfredo dipping sauce, because I can totally make a meal out of that). And I gotta be honest, I love Olive Garden with all my inner fat kid’s heart, so it’s always fun trying to recreate the restaurant experience at home. After all, a good copycat recipe means I can be in food heaven while in my pajamas and watching Netflix. Which is pretty much my goal in life: good food and Netflix. And as far as copycat recipes go, I feel this is the closest I’ve come to hitting the mark for this particular dish. I think there will always be something “special” about ordering the authentic dish at Olive Garden (because I mean, it is cooked in the same room as the alfredo and breadsticks – that magic rubs off on everything) but as far as “bringing the taste of the restaurant home” goes, this recipe will do more than enough to calm my cravings. Naturally, I was extremely happy and flattered that he liked it, but I was also really relieved. I’ve always been nervous about cooking for other people, and this blog has amplified the pressure a little bit – our friends and family see me posting all these recipes, so the whole idea of me cooking dinner has become a little more exciting than it used to be. And I tell them all the time that I’ll be more than happy to cook for them, but it’s certainly not every day that I actually get the chance to. Real life and schedules always seem to get in the way. So I was extremely thankful that I picked this week of all weeks to buy the ingredients for this recipe, and thankful this was the week he happened to be in town to join us for a meal, because I think our little impromptu dinner party has bumped my cooking cred up a few notches. And I’ll be riding the high on that accomplishment well into next week. While oven preheats, prepare pasta to package instructions, reducing cook time by 1 minute. Drain pasta, cover, and set aside. Pour melted butter in the bottom of a deep 8x8 baking dish. Add raw shrimp and parsley, then toss to coat. Shrimp should line the bottom of the dish in an even layer. 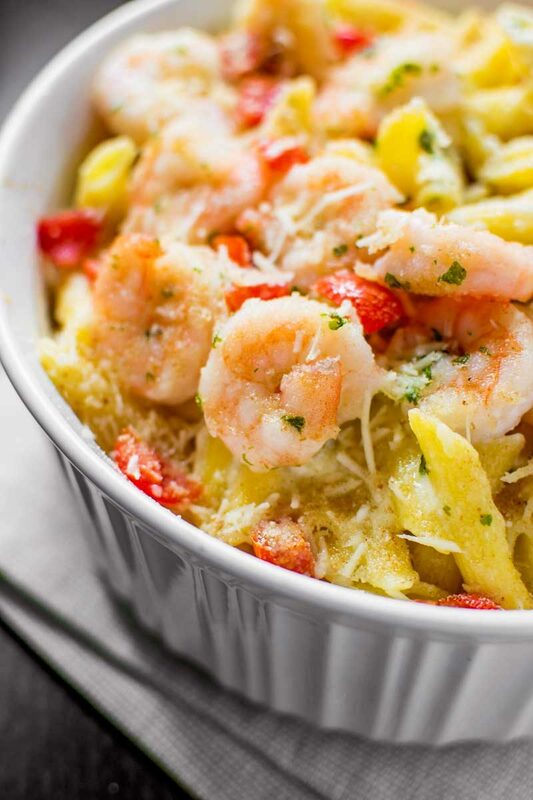 Cook shrimp in the oven for 15 minutes. While shrimp cooks, pour heavy whipping cream into a medium saucepan. Over medium heat, bring cream to a boil. Cook cream for 5 minutes, whisking constantly to avoid boiling over. After 5 minutes, add parmesan cheese and salt + pepper to taste. Bring mixture to boil again, continuing to whisk, and cook for another 30 seconds. Remove from heat. Add cooked pasta to cream sauce and then toss to coat. 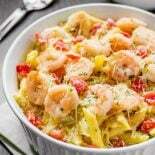 If shrimp is still cooking, cover and set aside pasta until shrimp is done. Once shrimp is done: Reduce oven temp to 350 F (Tip: prop oven door open for a few minutes to help it cool faster). Temporarily transfer shrimp and butter sauce to a small bowl. Pour pasta into the deep 8x8 baking dish, then add the buttery shrimp back in on top of the pasta. Finish off by sprinkling chopped cherry tomatoes, 1-2 tablespoons of parmesan cheese, and breadcrumbs on top. Bake pasta for 10-12 minutes or until cheese looks slightly melted and tomatoes are tender. 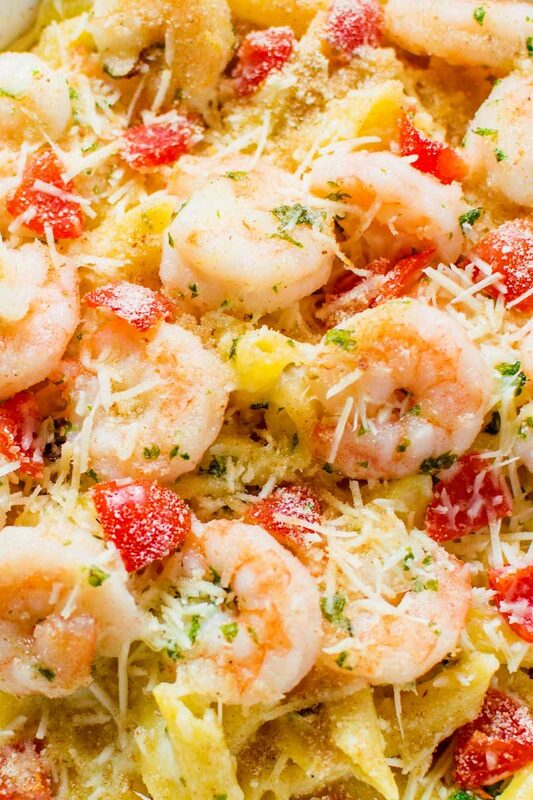 Let parmesan baked shrimp cool for 5 minutes before serving.